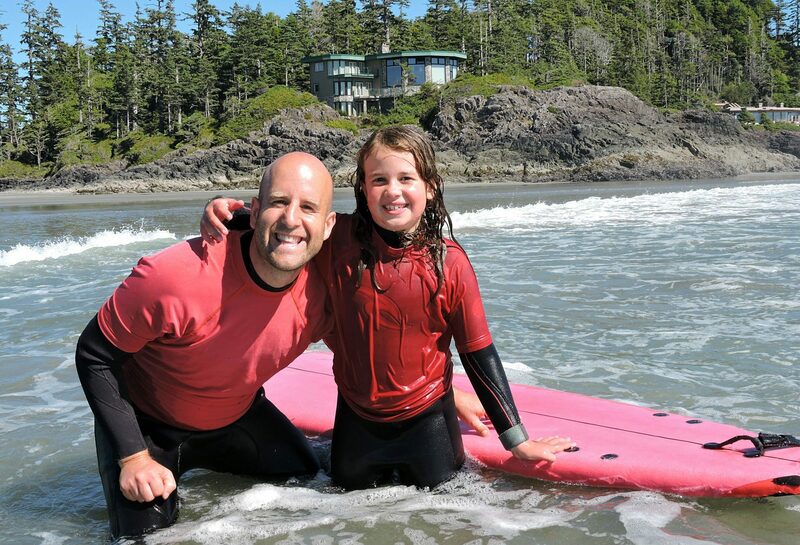 Vancouver Island Family Surf Lessons In Tofino! Surfing Canadian style in Tofino, BC on Vancouver Island. 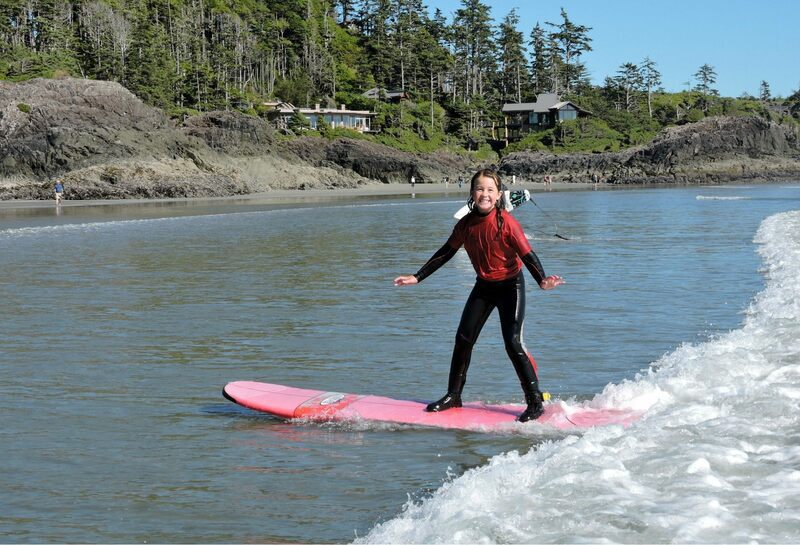 Believe it or not Tofino is nationally known for it’s surfing competitions! Our family surf lesson was fantastic! Lifelong memories for sure. When you picture Canada, often beaches and surfers yelling “HANG TEN!” don’t readily come to mind. Well, that’s all going to change after reading this blog post! 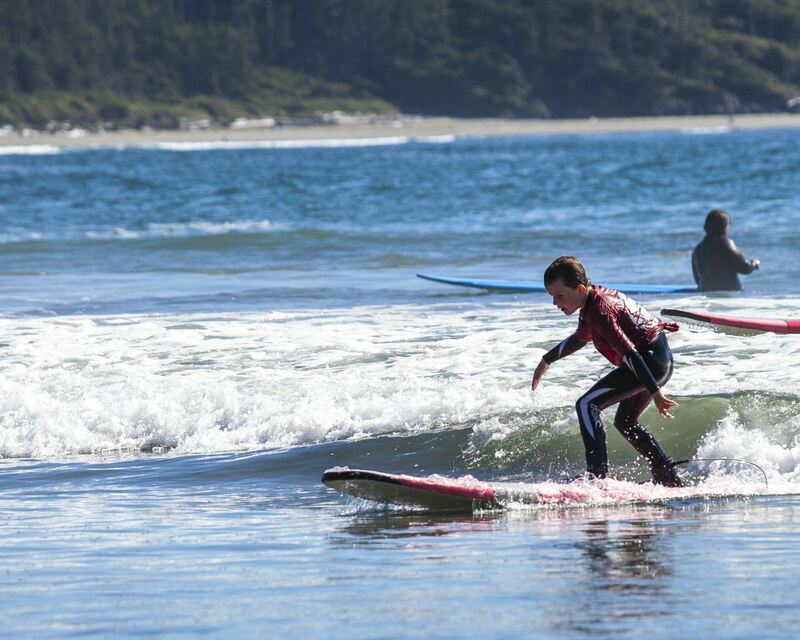 You can literally do it all on Vancouver Island and that means surfing Canadian Style! On Vancouver Island there is a quaint beach surf town called Tofino on the upper part of Vancouver Island West Side. This little beach town even holds internationally recognized surfing competitions! Albeit appropriately named “Cold Water Classic”. 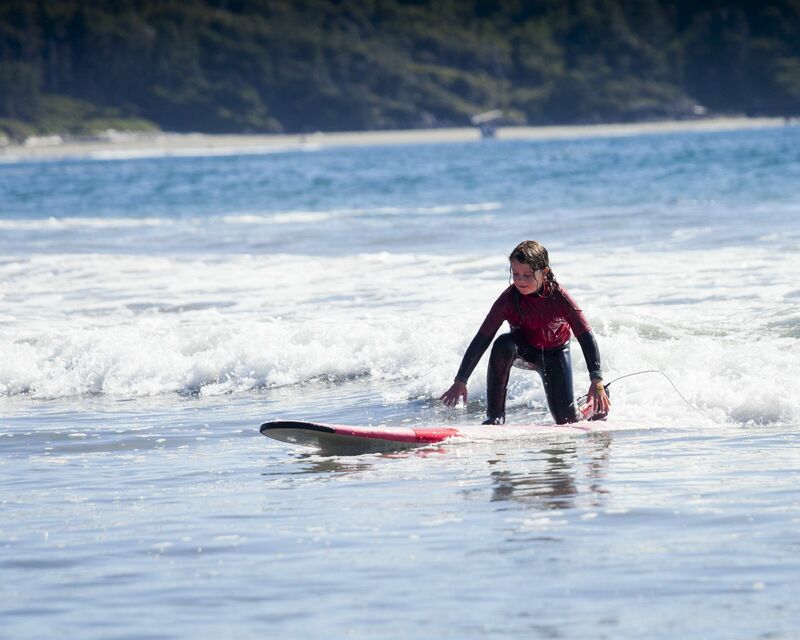 We have been to Tofino many times for whale & bear watching, hiking, camping, playing on the beach… BUT this time the Traveling Islanders went SURFING!! It was our family’s first time surfing, so we felt it prudent to go for a family surfing lesson. We met up with our instructor at Tofino Surf Adventures to kick things off. First off, in Canada you definitely need a wet suit if you are going to spend any amount of time surfing. For kids, it is absolutely essential. 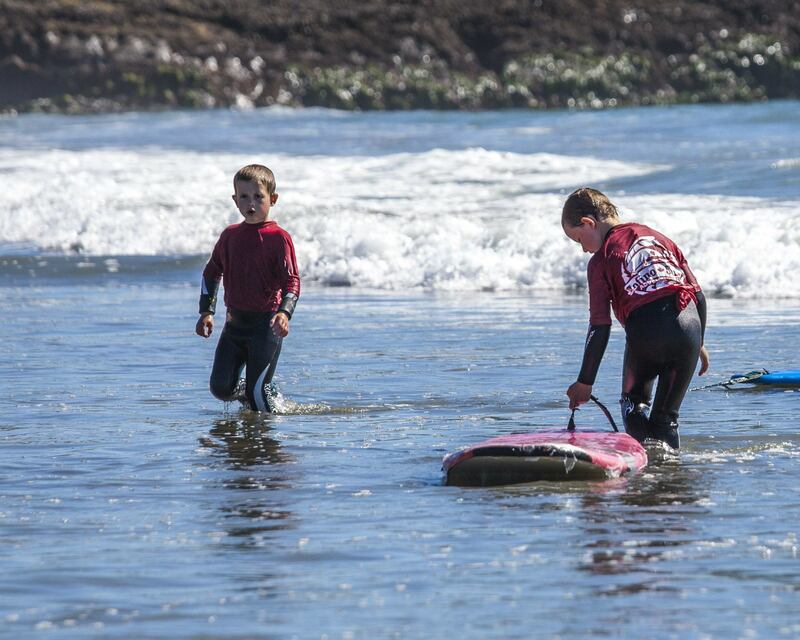 One of our favourite things to do on a Tofino vacation is just to play in the water in wetsuits! It was their first time putting on a wetsuit so it was quite the show as Gretta and I pulled, hopped, laughed and pushed our kids into their suits. We all just giggled and giggled while suiting up. After the kids were all ready to go, they declared themselves surfing ninjas as they ran and bounced around the parking lot. I loved this adventure already and we weren’t even at the beach yet! Our Tofino Surf Adventures instructor chose Chesterman Beach on the South End for our surfing lesson. It was a gorgeous beach with fantastic waves to learn on. I can’t believe this is Canada!!!? I kept thinking to myself. Pristine beach, beautiful ocean waves, and I’m about to go surfing with my family! This is so awesome!!! After a quick lesson on the beach with our instructor we all felt confident we were ready to surf the waves. 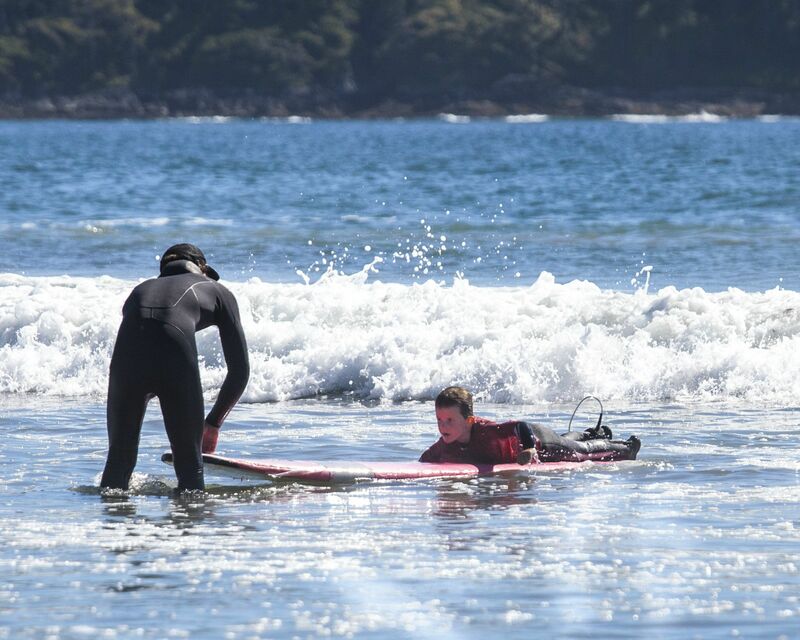 Our Tofino Surf Adventures instructor was very kind and patient with the kids, it probably helped that he had a very laid pack surfer mindset. We always felt safe, relaxed and ready for more! My kids are 8,6 & 5 and have never surfed before, so I was really wondering how this was going to go. My 5 year old shocked us all as he surfed right by me catching the very first wave! I couldn’t believe it! My 6 year old was definitely the pro by the end as he was standing up on pretty much every wave and was riding all the way to the beach. He loved surfing and can’t wait to go back. My 8 year old… well she tried and tried and couldn’t quite get it at first. After a little quality time on the beach with our Golden Retriver, she decided it was time to try again. As you can tell by the satisfied smirk on her face, she felt pretty good about herself. We were warned before heading out to surf that kids learn much quicker than adults. In Gretta and my case… that turned out to be VERY true. Although I’d like to think having a taller and slightly larger body standing on a surf board has something to do with it. We did eventually get up and loved it, but what a work out! Yes, our Tofino Surf Adventure instructor had a little bit of a different approach. We are so glad we went with Tofino Surf Adventures! I’m confident we all had a fantastic first time surfing experience because of it. If you are an Islander or vacationing on Vancouver Island you definitely need to add Canadian surfing to your bucket list! I need to find some surfing gear. I foresee some more surf trips in our future.Especially if we are going to keep playing in these Tofino waves. Our trusty waterlogged Golden Retriever Mango watching us from the beach. Use Discount Code “Islanders 10% Off” and save some dollars! • Tofino Surf Adventures took care of all our gear needs! All we needed to do was follow our instructor to the beach, park our car and help carry the surf board. Arrive early for your lesson so you don’t miss a minute! • Lots of different surf lessons to choose from. We enjoyed the Family Group Lesson, specially designed for young families. • Bring a snack and water for reenergizing, you will need it! Its customary to leave everything on the beach. • There was a bathroom and freezing showers to wash off salt water by the parking lot. • We surfed at South Chesterman beach close to Tofino. While our family’s experience with Tofino Surf Adventures was complimentary, you can rest assured that our thoughts, opinions, and findings are our own as always. Previous postA Date With My Daughter At Tofino Tea Bar Next postMemories gone by of traveling on VIA Rail train.